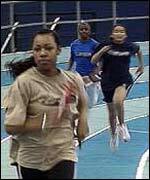 BBC NEWS | UK | England | Golden future for city athletes? Golden future for city athletes? Will Birmingham's children get a taste for glory? Birmingham is playing host to one of this year's most important athletics events - but are tomorrow's stars inspired by the World Indoor Athletics Championships? The city of Birmingham - already proud of its rich history as a centre for industry - is also gaining a growing reputation for excellence in athletics. 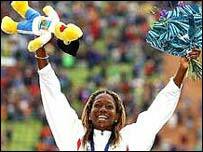 Triple-jumper Ashia Hansen and sprinters Mark Lewis-Francis and Daniel Caines are from, or have close links with, the city. And on Friday its stunning National Indoor Arena (NIA) will be the venue for the World Indoor Athletics Championships. Now the hope among sports officials in Birmingham is that the presence of local stars at the event will have a further impact on West Midlands athletics. Many of the facilities for Birmingham to produce the next generation of gold medal winners are already in place. At Birchfield Harriers, where Hansen, Lewis-Francis and Caines all train, Birmingham has one of the UK's most famous athletics clubs. And these are comparatively prosperous times for the sport, with an injection of lottery cash helping to pay for the recently-completed £3.3m High Performance Centre, next to the Harriers' Alexander Stadium home. Keith Holt, the club's schools liaison manager, is in no doubt the games will act as a huge spur to local children to take up athletics. "You see it presented in the form of a World Championship and it excites them," he said. "We get parents of youngsters on the phone saying: 'What can you do for our sons?' It definitely acts as a magnet." The governing body for the sport, UK Athletics, certainly recognises the pulling power of major events such as the World Indoor Athletics Championships. Abigail Ashby, a talent spotter at UK Athletics, said that the recent launch of the Birmingham Talent Identification Academy - a scheme to uncover promising young athletes - was purposely scheduled to coincide with the championships. The initiative is already proving successful, with a number of promising juniors coming to train at the High Performance Centre under the watchful eye of experienced coaches. But if any of those children hope to see their local heroes in perform in the flesh during the championships, they are likely to be disappointed. Keith Holt explained that even the most promising young athletes at Birchfield Harriers cannot be guaranteed a seat at the NIA. "You would think that we would have first pickings when it comes to tickets, but we don't," he said. "The club has a certain number, but we have a responsibility to our sponsors." With room for only about 15,000 people to attend the championships, there simply is not the capacity to meet demand, although there is extensive coverage of the games on BBC Two. 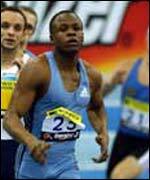 But as Mr Holt revealed, in the case of Mark Lewis-Francis, it was not Linford Christie's exploits at the '92 Barcelona Olympics that inspired him to knock on the door of the Birchfield Harriers, but pure luck. "He happened to drive past the entrance to the club and thought, 'I'll have a look in there' - really it was quite fortunate. "We try to capture talent when we see it, but we've got to see it, and that's the problem we're trying to address at the moment," Mr Holt added. Nevertheless, he expects the phones at Birchfield Harriers to "go crazy" during and immediately after the games. He added: "The big challenge is in keeping the kids afterwards."